Poker is one of the most adaptable games for creating casino table games. There are potentially 100’s of variants which could be used, and more than 25 games which you can play at the different online casinos. These include classics like 3 Card Poker and Caribbean Stud, though to innovative new games – often with big jackpot side bets, for example Let Em Ride. This page takes you through all of the different Casino Poker games offered at PlayTech casinos. Most of these are available in Instant-Play (browser, mobile devices) format as well as through the full download. These are the player-v-house games, and not the multi-player poker tables, which are covered over in the Online Poker section of this site. This is the oldest casino poker game. The combination of very easy game-play, combined with big payouts for when you hit the monster hands, keeps this game popular. 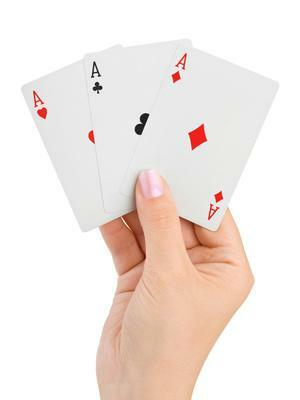 You get dealt 5 cards, which play against the dealer’s 5 card hand (one card is visible after the deal). Your only decision is whether to raise double your initial bet, or to fold. If you play, then the dealer must ‘qualify’ with Ace-King or better to play. If you beat a qualifying dealer hand, then you are paid based on how good your poker hand is. You can read more on the strategy and payouts for this game in this detailed Caribbean Stud Poker guide. There is a jackpot side-bet associated with Caribbean Stud, which is progressive. A Royal Flush wins you the whole amount, with a Straight Flush 10% of the pool – there are also big payouts for flushes and full houses. Most PlayTech casinos set the minimum bet at a very reasonable $1 for this game. This is an innovative game which is different from every other casino poker variation. You’ll have a choice of two ways to play each hand, which you decide after the deal has taken place. The choice is to try and make a great poker hand, or to bet on the point total of the cards you are dealt. 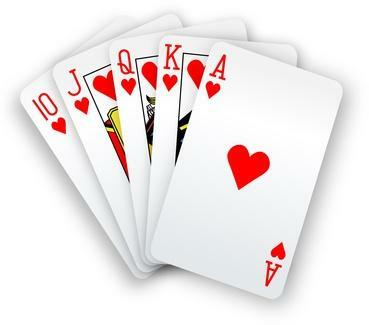 You get 4 cards to start with, and need a pair of aces or better to win the poker hand side. If your hand is low and junky, you can fold it. If you have potentially good (or even made) poker hand, then you should usually choose this bet (twice your ante). If your cards are high but mixed, then you can go for the points bet instead – with a total over 44 needed to win. The better your poker hand or points total, the bigger your payout. You can find the payouts either side of the table. I like this game a lot, it makes a refreshing change from the more common poker formats. Texas Holdem is overwhelmingly the most popular format when it comes to multiplayer poker games. Naturally, PlayTech has created a casino poker variation of this game. You are playing against the house in this format. While there is a flop, turn and river involved, the game-play has been simplified – you are only making a single decision in this game. You’ll see the flop, and your own hole-cards, and then need to decide whether to call (bet double your ante) or fold. If you call, then the turn and river are dealt and your hand is compared with the dealer’s hand. The dealer needs to qualify, by hitting 4-4 or better (in combination with the board cards). If not then you get 1-to-1 on your ante and your raise is returned. If the dealer does qualify, they your hands are matched up, with the best 5 card poker hand winning. You will get paid extra for stronger hands (info available on the side of the table). In addition there is an ‘AA Side Bet’ which is based on the strength of your hand and can pay out up to 100-to-1. This has a bigger edge than the main game, though it does add some extra interest to the game. This is the same game as described above, the difference is that the cards are being dealt in real time by an attractive croupier. You can chat via a text box and also interact with the other players. These games are a single hand which many people can bet on, and the action is fast enough to keep you interested. Some casinos stream games from the PlayTech studios, while others choose games from rival companies such as Evolution Technology. This casino poker format originated in Asia, and now enjoys huge popularity in live casinos as well as online. You get 7 cards to start each hand, and need to divide them up into a 2 card and 5 card poker hand. This is actually very easy, though PlayTech provide you with a button to allow the computer to do it for you (known as the ‘House Way’). PlayTech Pai Gow is the smoothest game out there, and can be played for just $1 per hand at most casinos. More of a novelty game than a serious casino poker game – though one which is worth a try as an alternative to the main formats. Here you see a flop, and 4 player cards. You can then bet on whether a specific opponent will win, or whether the dealer will beat a specific opponent. The odds you get depend on the relative chances. For example if one ‘player’ has a pair of aces, then choosing this one to win would not give you a big return, choosing the dealer to lose against an unpaired hands might be worth more – though does come with some risks. The PlayTech version of Let It Ride is not available at all casinos (I can only speculate that the bigger brand names have shied away from the patent issues). This poker variation is unique in that you’ll take chips away from game as the hand progresses – rather than add them. For more on the format and strategy of this very entertaining game, check out my Ultimate Guide to Let It Ride Online. After Caribbean Stud, this is the most popular live casino poker variation. It is fast, fun and has 2 bets to keep you interested. The pairs plus is a side-bet strictly speaking, though it really is such an integral part of the game that most people play it by default. The PlayTech version is called ‘Poker 3’. This is smooth and professional like the other PlayTech titles. The layout is a little more crowded than some of the other games (3 hands with 3 betting circles each make this hard to avoid). All-in-all a great version of this classic game. PlayTech did not get to be one of the biggest casino software providers by chance. Their games are top quality, and enjoyed by millions of players around the world every week. My favorite will always be the Caribbean Stud, though there are plenty of great variations to choose from. I recommend the award-winning BGO Casino to try out these games. This casino is UK licensed, and has a huge choice of titles from PlayTech as well as a selection of instant-play games from other software providers. I recommed you check out the promos too, these are always changing and include many of the best deals you can find anywhere online. See www.bgo.com for yourself now!